We are excited to share the news that this month's winner of the Cortland Voice Teacher of the Month Award is Mrs. Alex Perry, a seventh and eighth grade mathematics teacher at the McGraw Central School District. 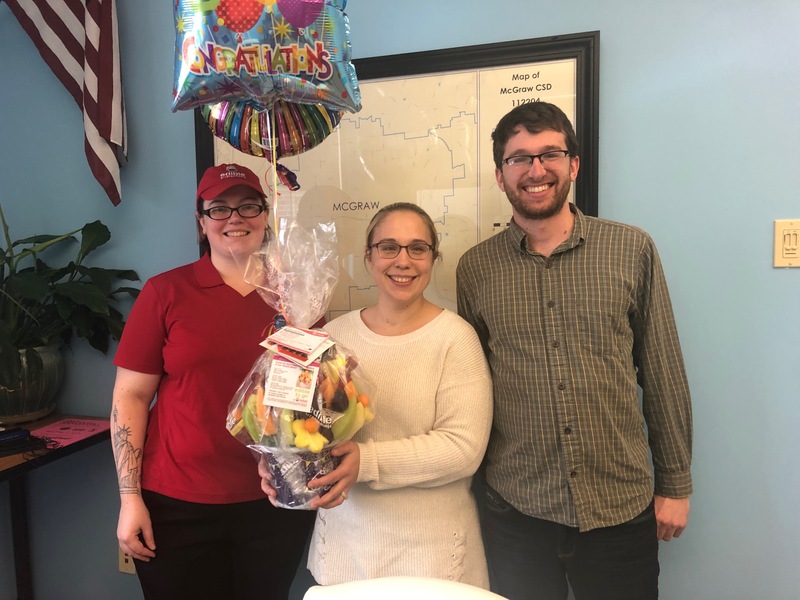 For her hard work and dedication, Perry received a complimentary gift basket courtesy of Edible Arrangements of Ithaca. Mrs. Perry has the distinct pleasure of teaching 7th and 8th grade mathematics. Middle school can be a difficult time in a child's life. The adults that surround them during this pivotal age provide assurance and guidance that are instrumental for future success. Mrs. Perry makes connections with her students through hands on activities and lessons that emulate real life. She gives purpose to her instruction. The students are comfortable asking questions and delving deeper into content in order to master their understanding of the concepts. Mrs. Perry is one of the teachers that you see in the school buildings all summer long, researching new materials, developing curriculum, and coordinating vertical alignment with her colleagues in both our school and neighboring schools. She volunteers time to assist coaches with team sports and shows up at her student's games and events regularly. She is one of those people that did not become a teacher, she was born a teacher. Everything in her being exhibits a desire to educate and support others. She breaks the barriers between the haves and the have-nots. I am so fortunate to have the opportunity to work with this amazing educator. Nominations are now open for December. Visit our Teacher of the Month page to fill out a nomination form and vote for your favorite educator!